This report outlines the future look of Forrester's solution for security and risk (S&R) executives working on building an identity and access management strategy for the extended enterprise. 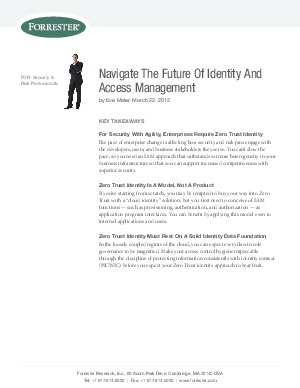 This report was designed to help you understand and navigate the major business and IT trends affecting identity and access management (IAM) during the next five years. IAM in 2012 has become a tool not just for security but also for business agility. Competitive challenges push businesses into the cloud and encourage mobile device use even without full-fledged access controls in place. These trends create pressing provisioning, authentication, and authorization challenges for S&R professionals. All the while, security threats and compliance requirements continue to swell. Read this report and learn why applying a Zero Trust information security model to IAM helps security pros unify and improve access control across the extended enterprise.